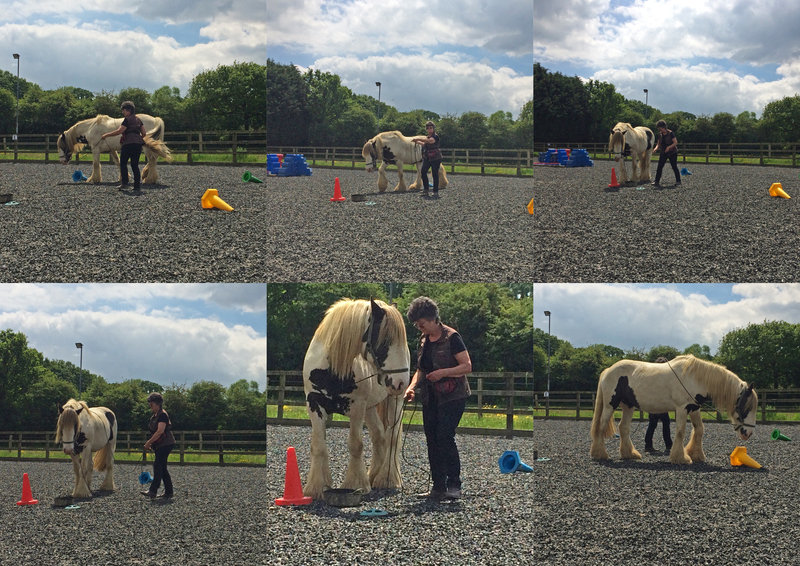 A couple of snippets from our 2nd lesson with Sally Ede. Mojo was calm and relaxed and focused. I used my body and a slight open rein to turn. We used scratches as reinforcement and he was forward going so only a slight touch with the leg to indicate ‘yes” that is what I want. I now want to add verbal cues to the rein cues but that will come after I get more confident riding. At the moment Mojo doesn’t seem bothered by my riding and as long as he is under his emotional threshold all is well. I did feel a little guilty as I wanted to use more positive reinforcement in our ridden sessions but I also need to know he can be ridden by anyone, as he will most probably out live me. Mojo up date – he had been in all night as he asked the yard owner to come in last night. Apparently he looks directly at her kitchen window and stamps his foot when he wants to come in to his stable. It was obviously too wet for him last night as at 5pm he was happy out and at 7ish he was at the gate asking to come in. He was a very muddy beast and quite hot, with all his hair, this morning, I brushed as much as I could and got lots of hair out. Then we went in the school to walk over the poles that were nicely laid out in a fan shape. Mojo was very good at this but did knock a few out of place. Then did his “carrot” stretches using a target and then giving the food. I left him in the school after the end of session signal and he went to look in the mirrors at the end of the school, he seemed quite intrigued at his reflection. We just need some dry weather for a prolonged period so the fields are not so waterlogged. Is this really Spring? It has been a while since I wrote anything on this blog, winter is always a difficult time of year for horse owners. Our fields are muddy and Mojo is a mud monster. He is still out unrugged, he does come in if the weather is particularly foul or the fields get too poached. Consequently I have only done basic care with him, a little bit of target training on the yard so he remembers, and some standing still on the yard too. He has a stationary target and stands there and eats hay whilst I groom him or pick out his feet. I am revisiting foot lifting as his fronts are perfect now but he still struggles a bit with the hinds, some times more than others. One of the liveries said when she got him in from the field he seemed a little stiff – probably slipped in all the mud. I checked him and did his stretching exercises – I do these with a target stick and he was very supple laterally. He is not so good at stretching down between his front legs but that was more that he was unsure of where the target was at first. He stretched his near hind but was a little stiffer on the off side, this is always the side the physios pick up on. We have regular physio visits and/or massage therapy. Plus saddle checks – not the I sit on him very often but it is important that he is comfortable. I do hope the wet weather stops soon and the fields can recover, we are fortunate to have a good school that doesn’t freeze or flood, so I can take him in there to do pole work or long lining – I must get on and do these again but can’t rustle up the enthusiasm in the wind and rain. Horses like just to be horses and as long as they are cared for and happy they will be OK. Plenty of forage in the field and friends to groom and hang out with, some shelter by the trees and a stable to come in to occasionally to dry out and have a sleep. I will make a list of things we need to revisit and reintroduce tack in the school before riding him, I don’t want him always to associate the arena with being ridden. The arena needs to be a place where fun things happen and I wont ride unless I know he is OK with everything to do with being ridden. Gone are the days when I just got on a horse, even when they are fidgeting or moving away from the mounting block – yes I have done that in the past but I know better now. This equestrian journey is never ending – as it should be for everyone. We never know everything and learn all the time – if we don’t we get stuck in the past and never progress in our horsemanship. My new Twitter account – this separates the photographic one from the equine posts. It looked at the 7 core emotions as described by Jaak Panksepp and how these affect our animals. 1. SEEKING – can be a positive or a negative emotion depending on whether the horse is seeking something they want or seeking to avoid something they don’t like. 2. PLAY- this is something we can tap into when training. 3 CARE – the mutual grooming and nurturing side of horses. 4. FEAR – can be as little as mild anxiety or a full flight response. 5. RAGE – fear can escalate into aggression or frustration if the horse can’t escape or get what he wants. 6. GRIEF or PANIC system may be seen in separation anxiety. I would recommend this course to anyone interested in looking into emotions in more depth. We often over look how our animals feel and many horses suppress their emotions and behaviour due to the way they are trained. Horses are an affiliative species and prefer to live in harmony with their friends. We often unwittingly suppress natural behaviour because we don’t understand the function and/or because we are afraid of losing control. Mojo was ridden by Liz Hibberd, he was very cool today, we used the “walk on” cue and the target. Then phased out the target and Liz just cued him to walk. He had one little spook when he trod on his own feathers – I really must cut them again. He even had a little trot at the end, then lots of praise, scratches and treats. Liz also sat on Indi for the first time and walked a few steps, we used my hand as a target and then the “walk on’ cue. Indi was very relaxed and we called it a day after a few steps. I had to a brilliant lesson today with Jo, Mojo still is not 100% OK with someone on his back and walking at the same time. So it back to the dummy rider and lots of SD and CC to weight and things flapping about. The first video he is learning to stand still at the mountng block and not try to turn round for the reinforcement. The second one is him targeting the cone so he takes a step forward, he was tense and a little worried by this and spooked twice – once when bitten by a fly and the other time when he touch my stirrup with his nose – my daughter thought he may have been punished in the past for this – as apparently people kick their horses nose away! It never occurred to me to do that. So Mojo may have expected punishment – we don’t know for sure that is why, but he was in a riding school at some point in his life and they may have tried to discourage this behaviour. Thank you Jo, I now have to remember everything! Jo has looked at the videos and thinks the second spook was due to Mojo touching a cone, there was some trigger stacking in play – the fly bit him and he was already at his emotional threshold – the cone touching his leg was the thing that send him over threshold. There is always a reason for a behaviour – we just need to look closely. I long/short lined Mojo for the first time this year. He was so relaxed and attentive. We only did a short session as it was very warm and humid. I set up the cones so he could walk from cone to cone. He seems to have learned to count to 4 now. I count down 4-3-2-1 bridge and treat. Must try next time with the cones in a straight line and gradually position myself further back.